King George's Guest House - Mill Park Accommodation. 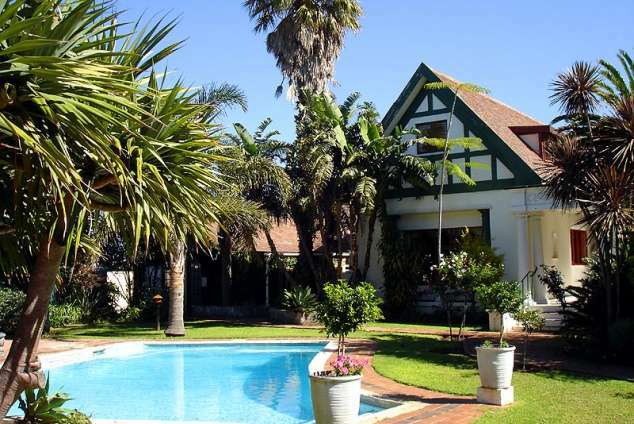 Situated in the heart of Port Elizabeth in the exclusive suburb of Mill Park lie King Georges and Newlands Guesthouses. We have graciously restored two of Port Elizabeth's oldest houses into 4 star Guesthouses, offering exclusivity, comfort and personalised service. Our Guesthouse is centrally located, with easy access to the airport, golf course, shopping centres, beaches and hospitals. We are also in walking distance to many fabulous restaurants and we are happy to book you dinner. Our Guesthouse has two lovely swimming pool situated in beautiful gardens, as well as braai facilities and an Honesty Bar for our guests usage. Each room is individually decorated and is provided with a private telephone, television set, hair dryer and tea and coffee making facility. Wireless internet is also available. We offer 8 en-suite rooms as well as two luxury suites that each has their own private lounge. A few of our rooms have their own private entrances and one room is situated right on the pool! There is also a self - catering flat that is ideal for families. We also offer 3 rooms that share a bathroom. All in all King Georges Guesthouse offers 15 beautifully decorated rooms that will make u feel welcome and at home. We also offer two conference facilities that can take up to a maximum of 22 delegates. Our conference team prides themselves in offering a personalized service and our 'wholesome and hearty' home - cooked meals remain a highlight for many of our clients. We offer secure parking as well as breakaway rooms. 9356 page views since 20 Apr, 2009. Last updated on 24 Apr, 2019.